A selection of short stories, chosen by Gilchrist (Sarah Conley, 1997, etc.) herself from every period of her career: one of those authoritative “big books” meant to be a compilation of the best that has gone before rather than something new. 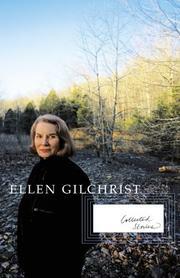 Anyone who’s familiar with Gilchrist will find her usual themes—southern bonhomie, wistful middle-aged lust, and lyric humor—in abundance from the very earliest pieces (The Land of Dreamy Dreams, 1985) to the most recent (Flights of Angels, 1998). Since this is obviously a volume aimed at fans, most of the quibbles it arouses will be over what’s left out rather than what’s included. Where, for example, is “A Man Who Looked Like Me” (the lost-love lament from The Courts of Love, 1996) or “Paris” (Rhoda goes abroad in The Age of Miracles, 1995)? Still, the 34 stories that do make the cut have enough familiar faces to satisfy most loyal followers. Prime cuts of choice prose.